I thought we’d take a moment to learn something neat about roses this week. Some thing that, while not essential, is fun to know. And that is how to time the bloom cycle on your roses. 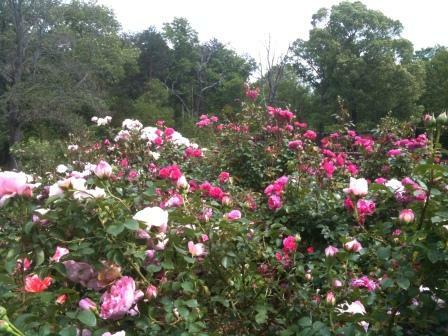 A mass of roses in bloom all at the same time is a great sight. What is the bloom cycle? This is the time it takes the rose bush to produce another flower. The beginning of the cycle is the moment you deadhead off the old bloom and the end is when a new bloom opens up. Say you have a party coming up in August and you want your roses in full bloom for the event. Or maybe a backyard wedding. Maybe you need a lot of cut flowers for a special event. Or your in-laws are coming to visit and you want to score some points. Regardless of your reasons it’s a fun thing to know how to do. Timing the bloom cycle involves cutting off all blooms and buds so the bloom cycle for the entire bush begins and ends at the same time. Exhibitors do this to get ready for a big show. We’ll start with how to do it and then you can use the chart below to determine what the bloom cycle is for your particular plant. or outward facing eyes. I just make sure I’m cutting above healthy vigorous growth. Now, during normal deadheading we only have to worry about cutting off the blooms that are faded or no longer have petals. This encourages the bush to constantly replenish itself and gives you a pretty constant bloom over the growing year. But for this we are trying to time the bush to cover itself in blooms all at once. Not only one bush but your whole garden. Beautiful? Yes. But it calls for radical surgery to pull it off. All the blooms, new and old, and all the buds have to be cut off. No exceptions. A true expert can play with this rule but this kind of touch is beyond most of us. So cut off everything. New buds, new blooms and old blooms. A couple of things to remember. The chart is timed using cuts at the level of the second or third leaflet group below the bloom or bud. The further down you go the longer it takes for the blooms to come back. The general rule of thumb is to add about five more days for each additional leaflet group you go down. Using the chart below is easy. Look up the type of plant you have and the number of days in the bloom cycle. Find the date of your event on the calendar, count back the numbers of days in the bloom cycle and that’s when you should make all your cuts. This chart was written for late spring/summer time temps here in the foothills of the Carolinas. If you are in a cooler climate add a few days and in a really warm climate subtract a few. If you aren’t sure then cut 1/3 of your bushes one day, 1/3 a few days later and the rest a few days after that. At least something will have flowers! That should do it. Just remember the simple rules. Take it all off and make your cuts above the second or third leaflet group. Those are the basics. Now get out there and impress your guests!